Hearthstone has announced its first expansion of 2018. The Witchhood serves up 135 new cards, featuring werewolves, ghosts, and other creepy creatures. 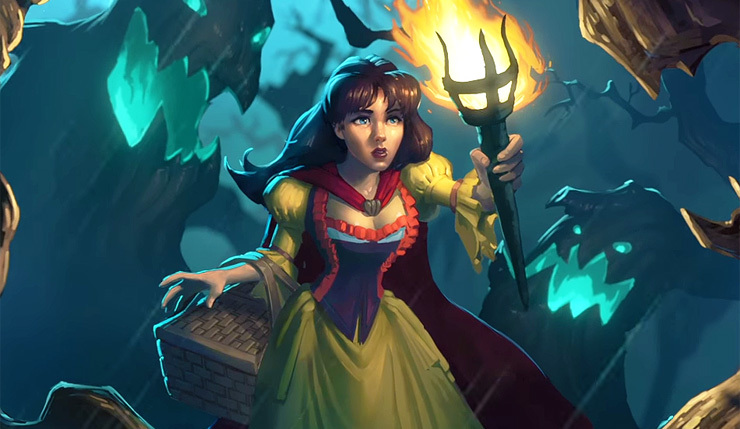 Blizzard has released a wacky Blair Witch-inspired trailer for The Witchwood, which includes an introduction to six of the new cards (Azalina Soulthief, Genn Greymane, Baku the Mooneater, Phantom Militia, Pumpkin Peasant, and Militia Commander). Watch it, below. Something spooky is stirring in the heart of The Witchwood, the next expansion for Blizzard’s Hearthstone. Dark magic has twisted the creatures of the forest and set them loose upon the Gilnean capital in Azeroth, but King Genn Greymane and his lycanthropic subjects won’t make for easy prey. The citizens of this proud kingdom, who can shapeshift into ferocious wolf-beasts known as worgen, are bringing the fight to The Witchwood with tooth and claw—and soon, Hearthstone players will join the pack and help them face down the horrors within. Players can draw on an arsenal of new tricks, including the eerie new Echo keyword. Cards with Echo can be played over and over again, allowing players to call upon a minion or cast a spell multiple times in a turn as long as they have enough mana. In addition, crafty deck-builders can employ powerful minions that challenge them to use only odd- or even-cost cards in exchange for a potent advantage. Once the expansion is released, players will have two weeks to arm themselves before embarking on Monster Hunts, the thrilling new single-player Hearthstone experience that will send players deep into The Witchwood to stamp out the evils that lurk within. The leaders of Gilneas are finalizing preparations for these expeditions and will share more details in the weeks to come. The Witchwood will be released sometime in April. Players can pre-purchase a special Witchwood 50-pack card bundle, which comes with 20 bonus packs and the “In the Dark Wood” card, for free. Hearthstone is currently available on PC, Mac, and mobile platforms.